JORD publishes short innovative papers that will significantly advance knowledge and understanding of ocean dynamics. It publishes also commented tables of data from recent or old observations or experiments, provided they make a contribution to a research field of interest in marine sciences. 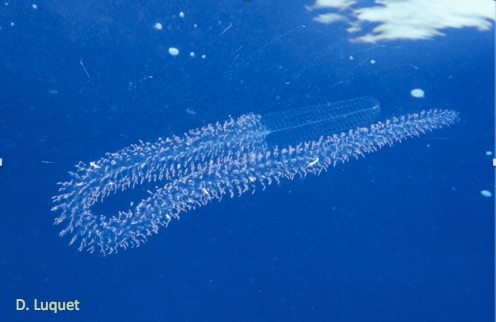 Forskalia edwardsi is a Physonecte siphonophore which appears as a linear colony of polyps, but behave as a single individual. On this picture, the animal swims, in a mouving sequence, on a curved trajectory which allows it to project elongating tentacular filaments which are covered with numerous nematocyst batteries. In resting mode, any prey bumping on this wide network extended around the siphonophore will be entangled by nematocysts filaments and swallowed by gastrozoïd polyps. Several extended tentacules are visible on top of the picture, but most of them are still folded.